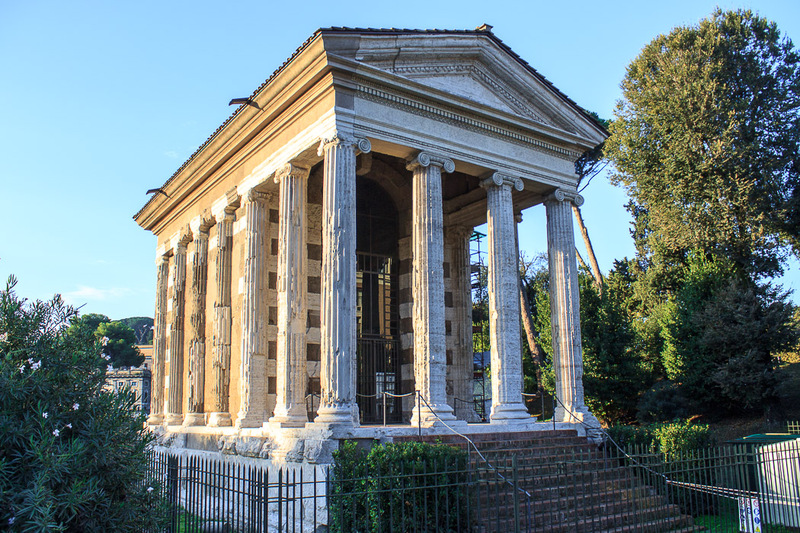 The Temple of Portunus is a small late-republican-era temple which overlooks the Tiber River in a park-like area across the street from Santa Maria in Cosmedin. 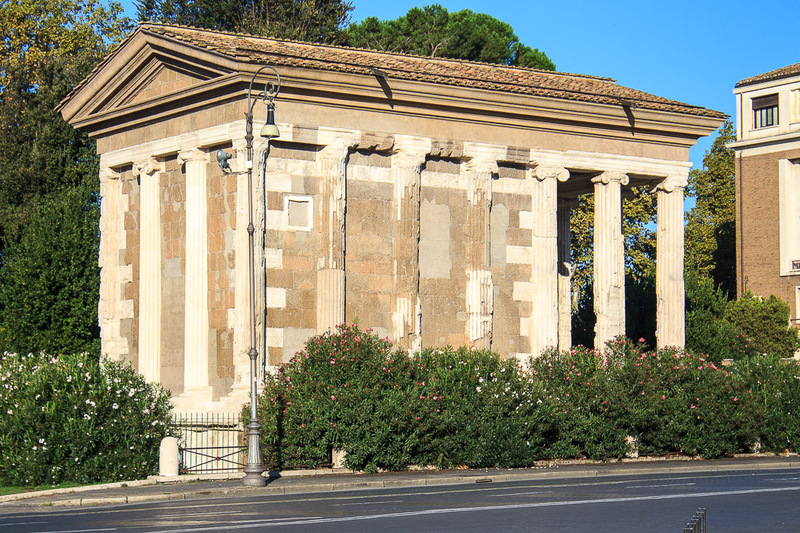 You'll often see the temple misnamed as the Temple of Fortuna Virilis, but the temple was actually dedicated to the river god Portunus. It was built in about 80 or 70 BC to replace an earlier temple from the 4th or 3rd century BC, and restored under Augustus. The bases of two statues set up in 2 BC in honor of Augustus' grandsons Gaius and Lucius, who were to succeed him as emperor but died as teenagers, were dug up in the area in front of the steps in 1551, and are now in the Capitoline Museum. The temple watched over barges as they entered Rome from the port of Ostia. Although this is difficult to imagine today with the walls that have been built around the Tiber to prevent flooding, back in the day the river was less isolated from the temple. The temple was converted to the church of St. Mary in 872 AD while it was still in good condition, and used as such during the Middle Ages, therefore was saved from destruction. 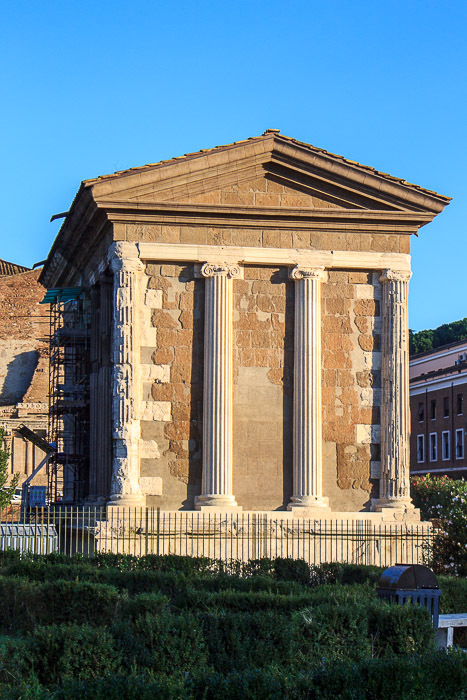 It is a simple rectangular temple with four Ionic columns in the front and back and seven Ionic columns on each side, raised on a high podium. The Ionic columns in the front are free-standing, but the rear five columns on each side and the four columns across the back are all engaged ()built into the walls). The temple is built with blocks of tufo; the columns are made of travertine, but were covered with plaster to imitate marble. 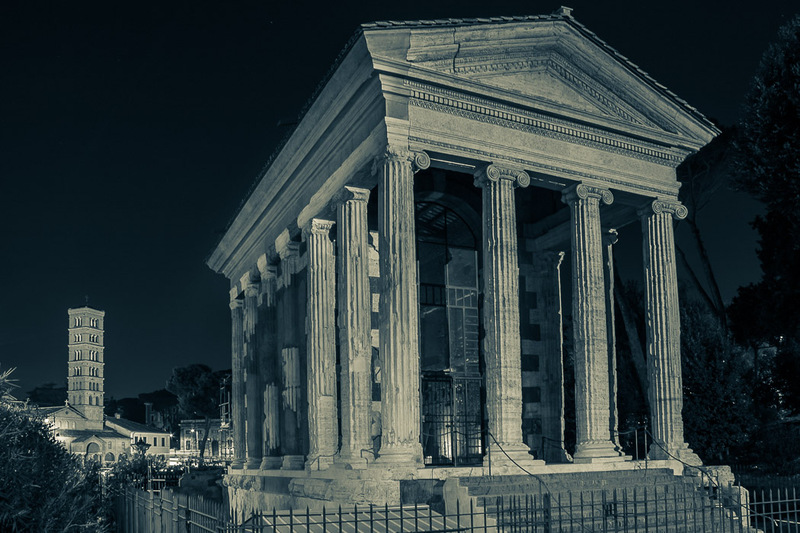 See all Temple of Portunus photos.